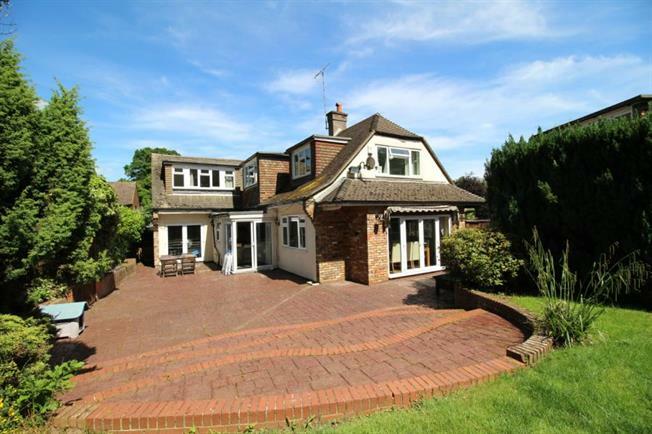 4 Bedroom Detached House For Sale in Brentwood for Asking Price £875,000. An imposing four bedroom detached property with separate garage/outbuilding (suitable as Annexe accommodation STPP), situated at the end of a private cul-de-sac, just off of Ingrave Road. Nestled in the corner of this turning, you will find this exceptionally spacious detached family home which is in need of modernising. The ground floor offers extensive living accommodation, with a beautiful triple aspect sitting room, overlooking the mature landscaped rear garden, separate family room with bar area, porch and impressive reception hall, fitted modern kitchen/breakfast room, drawing room and a cloakroom complete the ground floor. To the first floor is a master bedroom with an en suite shower room and dressing area and extensive fitted wardrobes, three further bedrooms, one of which has an en suite bathroom and another with shower and sink, plus a family bathroom with corner bath. In addition to the main house there is a detached garage, which has been extended to provide annexe accommodation comprising lounge area, shower room and a first floor bedroom. The property is complemented by a mature landscaped rear garden, with a large patio area, with steps opening to the lawn, with mature trees and shrubs. The front garden is block paved, providing off-street parking and access to the double garage. Brentwood's vibrant High Street offers a fine selection of restaurants, bars and shopping facilities, also some of the finest schools in the county, Brentwood's Mainline Railway Station is within one and a quarter miles and provides excellent access to the City and Shenfield mainline railway is less the two miles away providing fast access to London.